Check this Northwest Feature for more information. During the past years, Northwest Airlines designed and built a spectacular, state-of-the-art terminal at Wayne County's Detroit Metropolitan Airport. 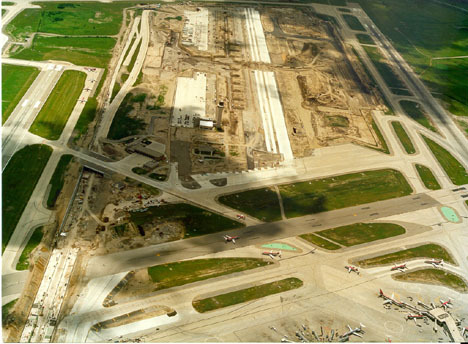 The project included the construction of a new international/domestic terminal (the 'Midfield Terminal') with 97 gates, airfield connections via aprons and taxiways, a large parking structure with 11,500 spaces, a multi-level system of access roads to the new terminal, and a power plant. 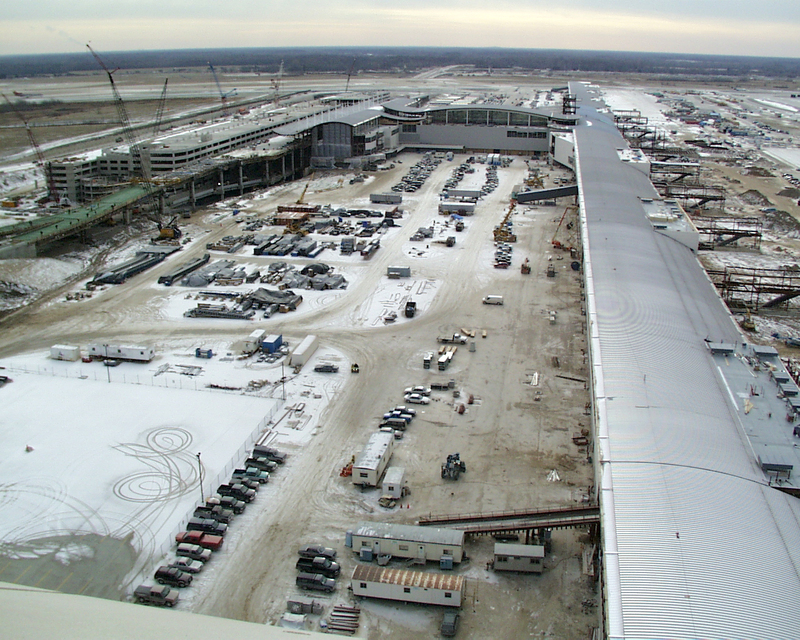 This 1.2 billion dollar expansion opened on February 24, 2002. The terminal was named after Wayne County commissioner McNamara. 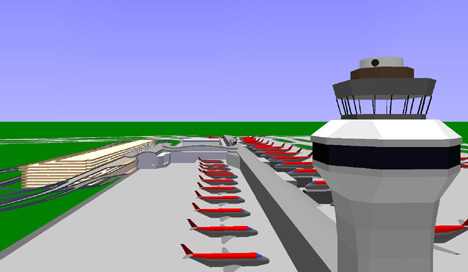 In cooperation with Northwest Airlines, the Virtual Reality Laboratory (VRL) at the College of Engineering at the University of Michigan developed a virtual model for the Detroit Midfield Terminal Project to assist in design evaluation and to support a complex decision making process. The photograph below on the left was taken before construction began. An incomplete part of the new access roads was already in place (right side of image). 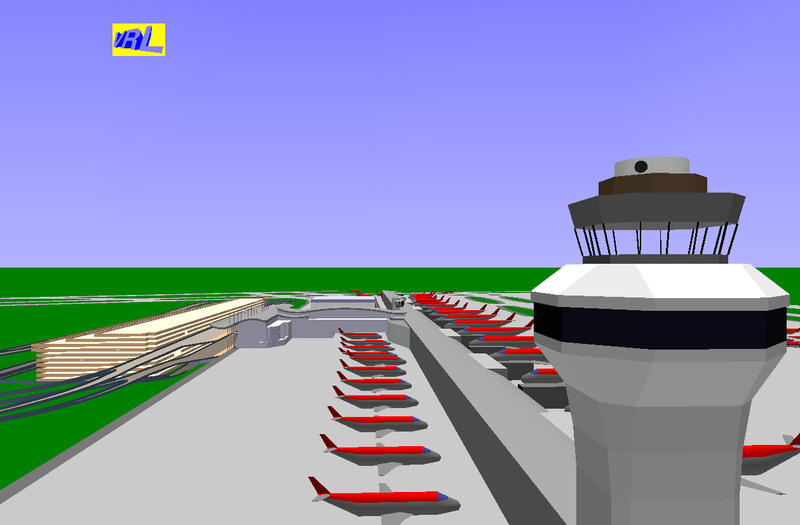 The existing air traffic control tower (center of image) marks one end of the new terminal. 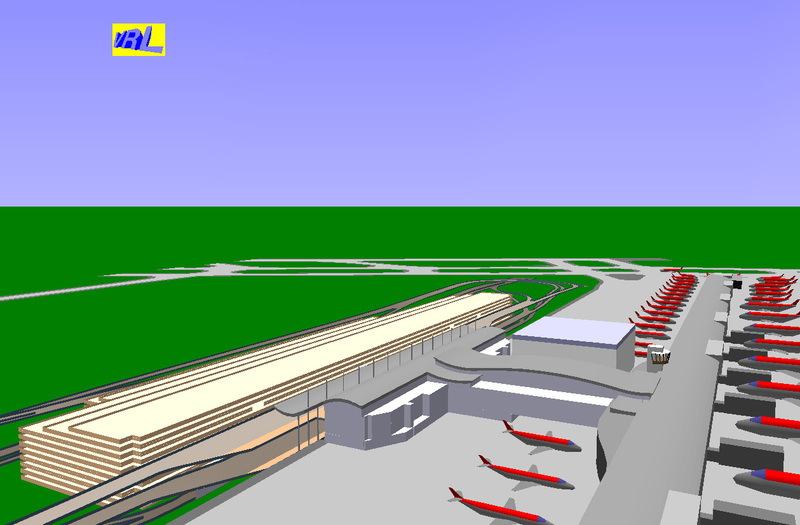 The terminal extends from the tower parallel to the new access roads towards the viewer and is approximately one mile in length. Visible in the background are the old terminal facilities. The images on the right and below show the construction progress. During the design phase, a three-dimensional computer model was developed at the University of Michigan and continuously updated as the design progressed. 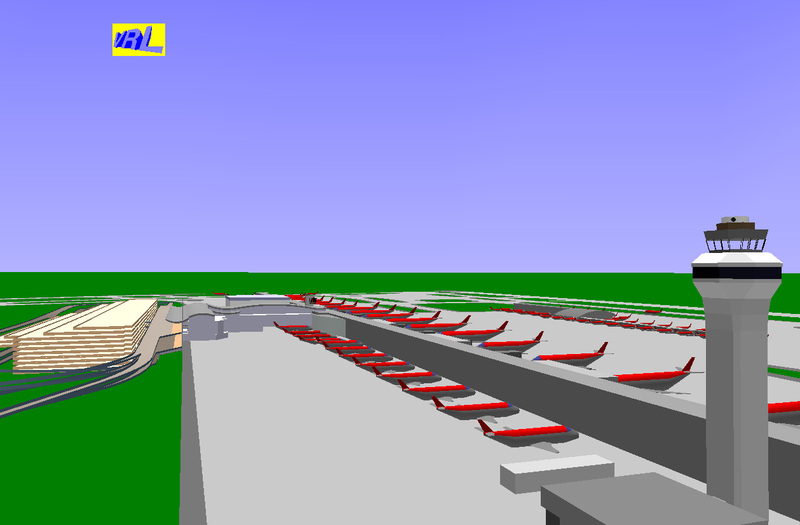 The images below are generated from this model and illustrate the impressive length of the main (or east) concourse (passengers can use the 'Express Tram' people mover to reach all the gates easily). 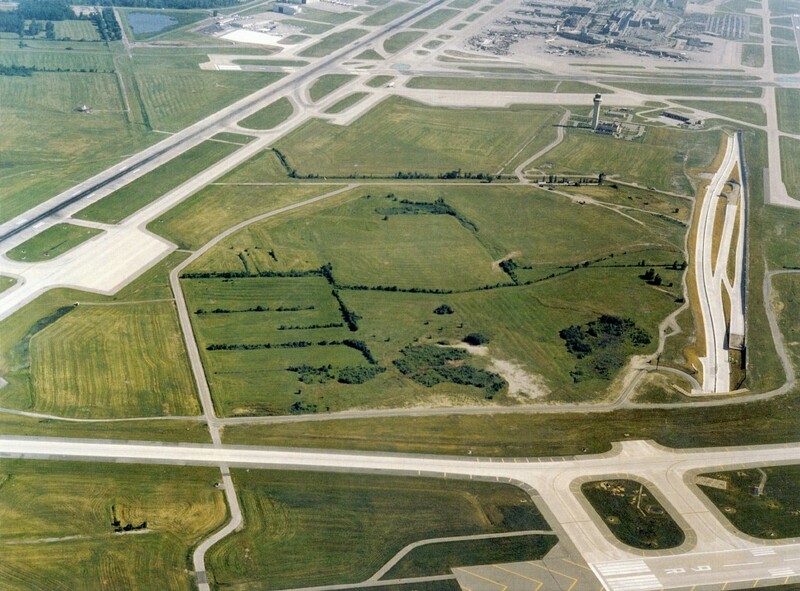 A remote west concourse, primarily for commuter aircraft, is accessible via an underground tunnel. The parking structure and the access roads are visible at the left of the main terminal building. The virtual model allows for the generation of any view. 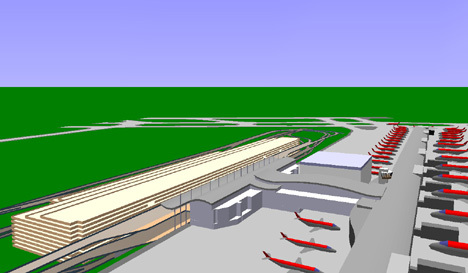 Below is a look at the main concourse from the existing control tower. 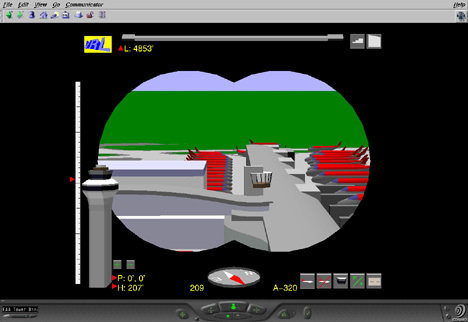 The image on the right simulates the view by an air traffic controller using a pair of binoculars. The new parking structure is located opposite to the Midfield Terminal building with its three levels of departures and arrivals areas. 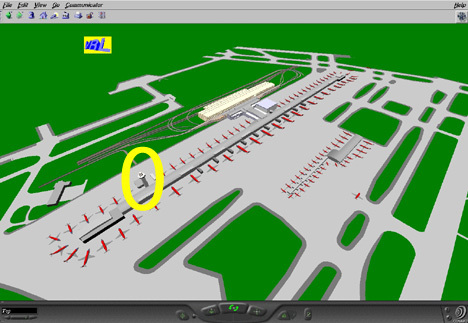 For a visitor arriving by car at the Midfield Terminal building, the road view of the international/domestic departures area is shown below on the left, the domestic arrivals area with pedestrian bridge to the parking structure is shown on the right. The international arrivals area is located one floor beneath on the lowest level. A major benefit of the virtual model is the capability to navigate in real-time through the Midfield Terminal (walk, fly, drive, and look around) and explore the many aspects of the design in three dimensions. The following short video illustrates a fly-over. 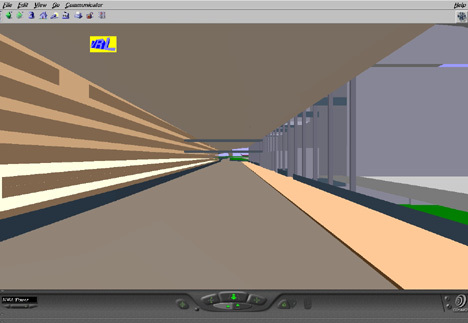 A three-dimensional computer model that can be modified quickly and adapted to changing design objectives was recognized as an extremely helpful tool in assisting architects and project engineers with evaluation and analysis tasks. 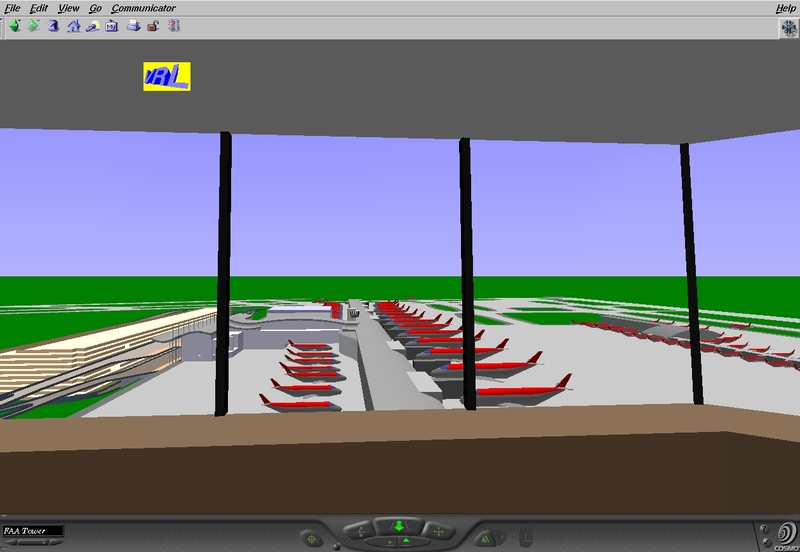 The virtual model is equipped with various controls allowing for an efficient generation of design alternatives. 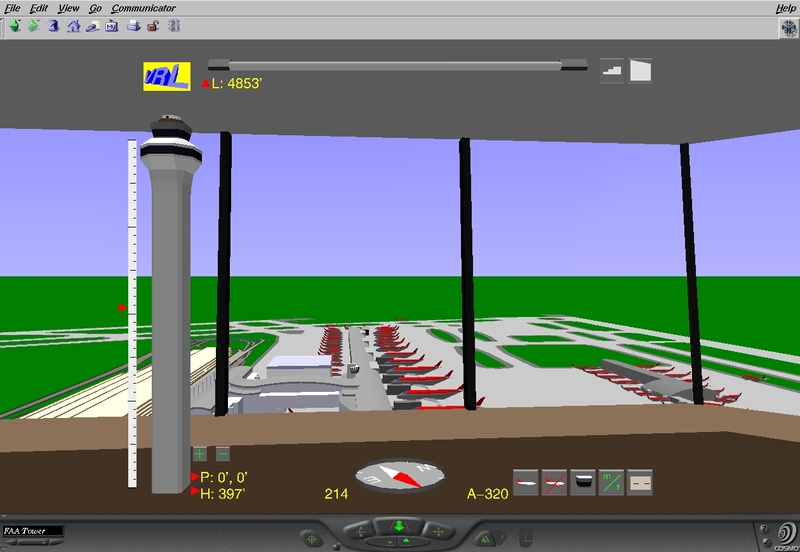 For example, a symbolic icon of the control tower can be stretched to increase the tower's height. At the same time, the resulting change in view from the tower's observation platform can be evaluated. 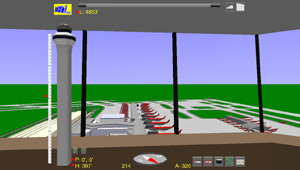 Other controls allow the user to change the length of concourses, move control towers, change the type of aircraft moving on taxi ways, simulate driving on access roads, etc. For any design variation, analysis tasks like visibility studies, layout evaluation, or compliance checks with FAA regulations can be performed immediately. 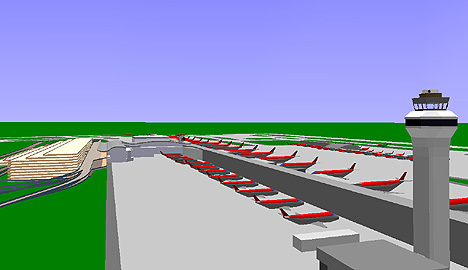 To facilitate collaboration among the many teams involved in this project (Northwest Airlines, Wayne County, the Federal Aviation Administration (FAA), and many others), the computer model was made available to all parties over the World Wide Web. A new feature of the Web called VRML (Virtual Reality Modeling Language) was successfully deployed by the University of Michigan in this large-scale project. VRML allows for the distribution of functional virtual reality applications over the Web. 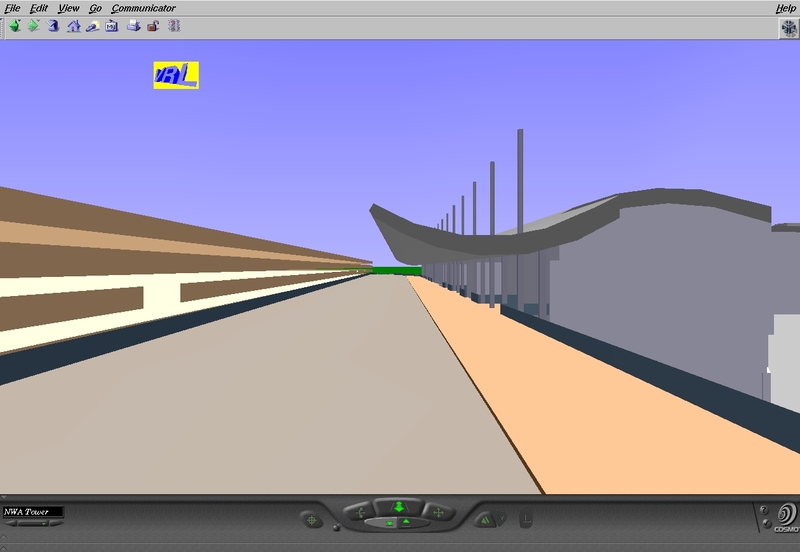 A Web user can download a VRML file, navigate through the three-dimensional model, and interact with the model on the computer's monitor. To view a VRML model on the Web, a special plug-in for the Web browser in use (Netscape or Explorer) is required. VRML plug-in's are available from various Web sites. We recommend the CosmoPlayer to view the version of the Midfield Terminal model provided below. To become familiar with this complex model, use the Viewpoint List (lower left of browser window) for a predefined tour. To interact with the model, check the explanation of available controls. 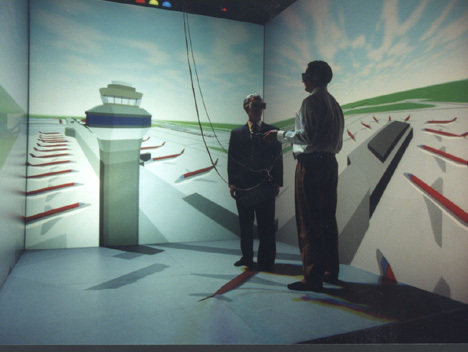 Once a three-dimensional computer model has been created, it can also be viewed using immersive virtual reality technologies like Head-Mounted Display devices or the projection-based CAVE system. 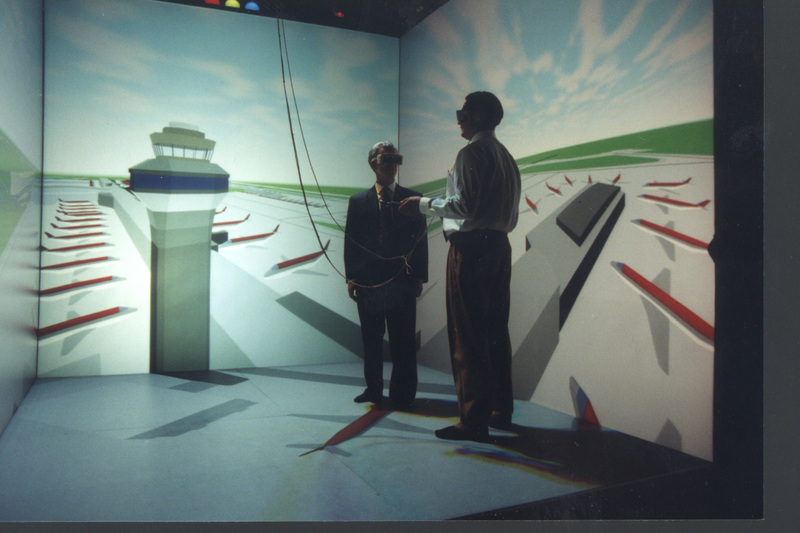 Such systems provide a realistic, full scale representation of the environment and include stereoscopic viewing. A brief description of immersive virtual reality systems can be found on our Web page Virtual Reality: A Short Introduction.